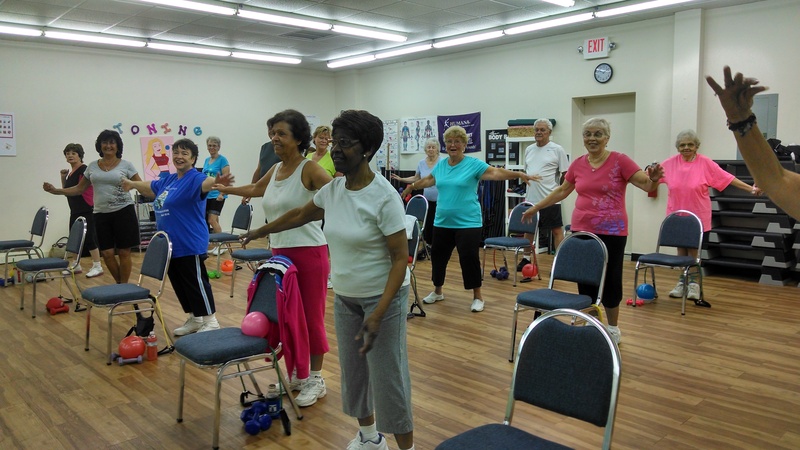 The senior class Vickie teaches offers a variety of exercises, which has been beneficial in improving my flexibility and toning. Every week, I look forward to attending group class, Vickie makes it fun and time goes by too quickly! I wanted you to know that you should be very proud of your ladies. We managed to continue coming to Silver Sneakers class 3 times a week after you left and had a number of “leaders” who just got in front of the class and we yelled out stuff to do!! We now have a very young woman (21) who is really trying to fit our needs. She welcomes suggestions and came prepared the first class even though her background is dance. She says she is amazed at how strong our group is. One day she might reach your level of skill but you are THE BEST. You always have a positive attitude, you are very knowledgeable and you seem to always enjoy yourself too!! I am wishing you the best and I know you will be successful at whatever you do. You have all the traits of a great fitness instructor and will be missed [at Marsh Creek]. Even as the class is compressed into a tiny space after the hurricane, you have solved the space challenge and adjusted the program to achieve maximum energy from the class. You are always positive, laughing and motivating the group to keep up the pace. I appreciate your well chosen music…Thanks for the gentle corrections to my routine and especially the praise when I get it right. All the best. Versatile, full body workouts are comprehensive, gentle but very strengthening! Exercises are tailored to your body’s needs. Forget physical therapy appointments: go to Vickie’s strengthening classes! Thank you for the great class. I enjoyed it tremendously. Thank you for instructions on proper use of the strength training machines in the gym. Great group class! Wish it could be more than once a week. It is fun, yet a good all-body workout. I have noticed the difference in my strength and flexibility in a short time. Love it! Thanks Vickie! With your help over the past year I was able to drop 32 pounds and gain unlimited self-confidence. 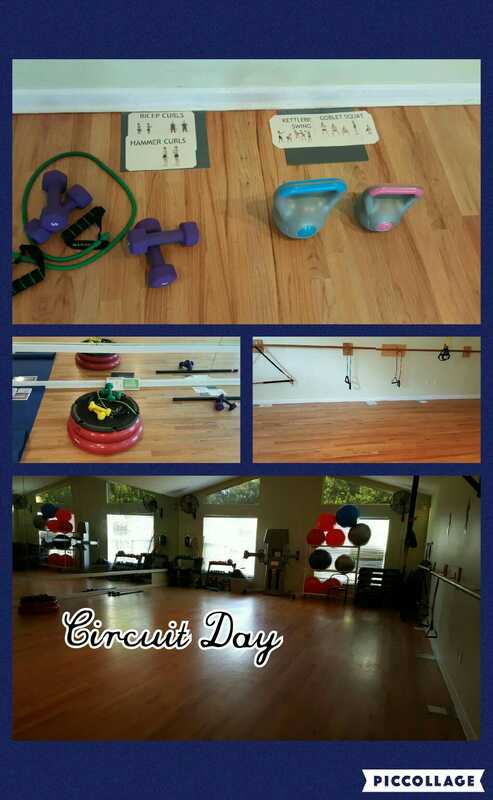 Your 30 minute circuit training is my favorite time of the week. I look forward to continue working with you to lose the next 30 pounds, thanks again! I’m a ‘senior’, in good health and just celebrated 100 years on the planet! Vickie’s classes are clear, consistent, and charged with strengthening workouts, even I can do well, and happily! I feel good after each session. If I can do it, so can you! 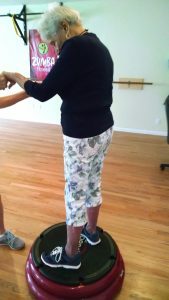 Vickie offers group training for virtually anyone from age 10-102! Group Fitness offers a variety of exercises for ALL fitness levels. 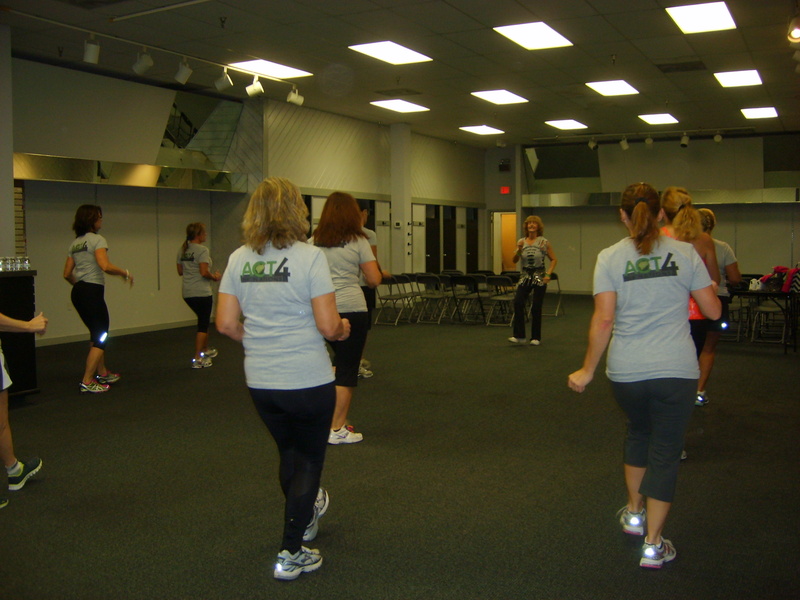 Fit2Go4It makes fitness FUN, with a certified instructor and motivating music to help YOU find the zone. My clients are from the surrounding Hernando, Florida area. I bring the gym to you! As a mobile based fitness company, I can train in the comforts of your own home; whether it's in your backyard, garage, or living room. We can also train at your local park or beach. I will find the best solution for your group! Cancellation Policy | Fit2Go4It understands that unanticipated events happen occasionally in everyone’s life. In the desire to be effective and fair to all clients, the following policy will be honored: 24 hour advance notice is required when canceling an appointment. This allows the opportunity for someone else to schedule an appointment. If you are unable to give 24 hours advance notice you will be charged the $20 of your appointment. This amount must be paid prior to your next scheduled appointment. 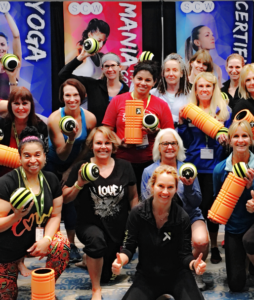 Have you attended a Group Class with Vickie? Vickie brings so much energy and enthusiasm to every class. She goes the extra mile to make each person feel like they are important and she wants us to achieve our fitness goals right along side her. Love all her classes. We are blessed to have her! Vickie is an excellent trainer. I have been training with her for a year now. She gives us the perfect combination of tough ("you are KILLING me!") and positive (" Ladies, you are doing SO good"). 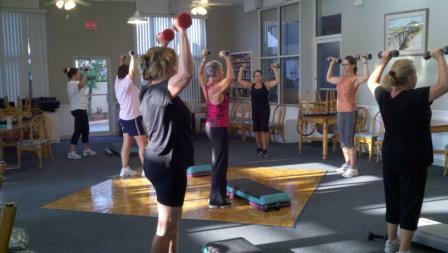 Vickie adapts her group training to meet the needs of all of her ladies. She works with the whole person -- mentally, emotionally and physically (goodbye stress). Because of her efforts, I am stronger and more flexible, and most importantly, working out is fun. Her infectious personality makes me want to exercise. I have known and worked with Vickie for over two years. She is the consummate professional. Her classes are well structured and adaptable to various levels of fitness. Vickie keeps an eye on the entire room to make sure people are in the correct position and using the correct weights. It is amazing how she can mix up the class to make sure all muscle groups are worked in any given week while keeping it fun and interesting. It is amazing to me that she can remember everyone’s name which goes a long way in making people feel welcome. My physical well-being and overall health have benefitted in the last year because of Vickie Melton's professional instruction...She is highly qualified as a personal trainer and group fitness instructor. Vickie Melton is dependable and an incredibly hard worker. She is always on time, prepared with an exercise plan and never absent..She is an enthusiastic instructor and I highly recommend her! You [Vickie] have all the traits of a great fitness instructor and will be missed [at Marsh Creek]. Even as the class is compressed into a tiny space after the hurricane, you have solved the space challenge and adjusted the program to achieve maximum energy from the class. You are always positive, laughing and motivating the group to keep up the pace. I appreciate your well chosen music…Thanks for the gentle corrections to my routine and especially the praise when I get it right. All the best. Vickie, you are a true professional. Your group classes at Marsh Creek CC are excellent. Although I have only been attending for a short time I have increased my strength. You also have a great knowledge of the exercise machines and convey that in such a way that I feel confident I can use them properly. I highly recommend your classes. Vicki - I wanted to let you know how much I have enjoyed your classes at Marsh Creek. You are a great coach and trainer. Hands down the best I've experienced!! I look forward to continuing ... when I return from summer in West Virginia. Vicky designs creative ever-changing routines that provide challenge for all ability levels. Her instruction is clear and sequenced to make it easy to attain success while helping you understand which specific muscle groups are being engaged. Most of all she makes it fun, and inspires a sense of confidence. It's the best hour of my week! Thank you!